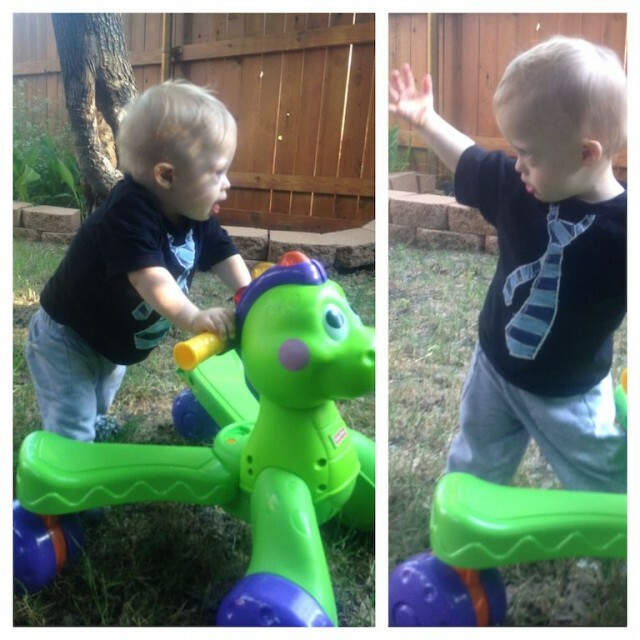 You are here: Home / Resources / The Best Push Toy In the Whole Wide World: The Stride-to-Ride Dino! The Best Push Toy In the Whole Wide World: The Stride-to-Ride Dino! Ok, so maybe this push toy isn’t the best one in the World, but the Stride to Ride Dino is the best push toy I’ve ever seen for a child learning to walk on their own. After you read my little ‘mini-review’ at the end of this post, be sure to let me know if you agree, or disagree. Me: Oh my gosh, I’m so worried! Why does Noah have all these little bruises all over his body? You don’t think he has cancer do you? My wife (a pediatrician): No Rick. He’s just a curious little boy. Small bruises like that are normal. My wife: Yes, 100% sure. Me: You don’t think we should ask our pediatrician to run a CBC on him, just to make sure. Me: How do you know it’s not leukemia though? Don’t you get bruises like that when you have leukemia? Ha,ha, I don’t know what I would do if I wasn’t married to a pediatrician (who isn’t a worrier, like I can be sometimes.) Oh wait, I do. I’d be in the ER every other day with a silly question. Yelp, I’d be that parent. (And I’d be totally cool with it!) By the way, we actually both got a little worried that Noah had Leukemia once, but he didn’t. But, boy did I learn a few things after going through that little scare. Anyway, it’s been a lot of fun watching Noah start to pull up on stuff, and inchworm all over our house. It’s seriously one of the cutest things I’ve ever seen. On top of that, newmilestones means getting to buy new baby toy! Which is always fun…for both Noah, and I! Noah likes his little friend, Mr. Dino! Noah’s been going through treadmill therapy to help him learn to walk, and we’ve been seeing some great results. In addition to the treadmill, his therapist uses a gait trainer as well as a variety of different push walkers to help him learn to walk. Since we do a lot of intentional playing at our house we wanted to find Noah the best push toy / walker we could find. We tried (and returned) several. Some (like the toy shopping carts) weren’t heavy enough on the front end (even if we loaded the basket up with stuff to weigh it down) and they would flip over on him. The Fisher-Price Go Baby Go! Stride-to-Ride Dino: Our Favorite Push Walker! Out of all of the push walkers we tried the Fisher Price Stride to Ride Dino was without a doubt our favorite. (In fact it even made our list of top toys!) If you are looking for the best walker for your child (regardless of if they have Down syndrome or not) I can’t recommend this one enough. As you can see in the video Noah’s able to pull himself up on it, and even takes some tiny first steps! There’s a lot of reasons why I like this Dino walker, but let me give you just a few. 1. It doesn’t flip over!! The best thing about this walker is, it doesn’t tump over when Noah pushes it. Most push toys (like the toy shopping cart) are built so that a child gets behind it and pushes. The Stride to Ride Dino is different. As you can see in the video, the legs of the dino spread apart, which allows a child stand to between them and push it; this keeps it from turning over. Hello? Can you say awesome! t’s a little hard to explain, but let me just tell you, we’ve tried a lot of toy walkers, and this was the only one that didn’t flip over! Which make it a keeper! 2. It lights up and plays fun music! When it comes to toys, the brighter the better as far as Noah’s concerned! Most of the other toy walkers I’ve seen don’t really have any “electronics” in them. The Fisher Price Dino on the other hand, does. 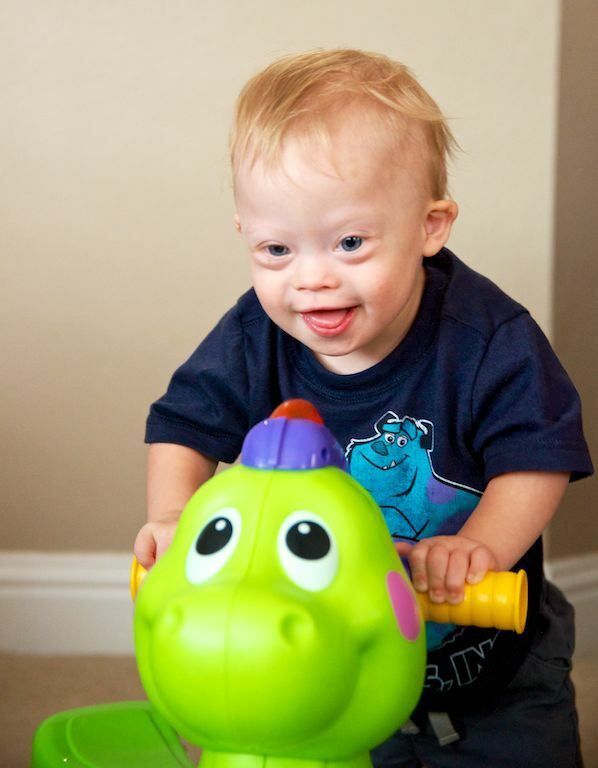 As the child pushes the walker, the dino’s horns light up and it plays fun music; and since this the horns are in front of the child, the flashing lights and fun music become a fantastic developmental motivator! 3. It’s grows with your child! Toys aren’t cheap, and as a parent I’m also looking for good deals on toys; and the longer life a toy has, the better value! This push toy is a great value because it’s really two toys in one; it’s not only a great push toy, but it’s also a fun riding toy. 4. It just looks fun! The dino push toy just looks a lot more fun and colorful than a lot of the other walkers out there, don’t you agree! And who doesn’t like cute, fun stuff! If you’re looking for a great push toy, this is the one to get. Trust me. It’s that good. By the way, be sure to check out our post on the top developmental toys, and let us know some of your favorites as well. Which push toys have you tried and liked (or didn’t like?) 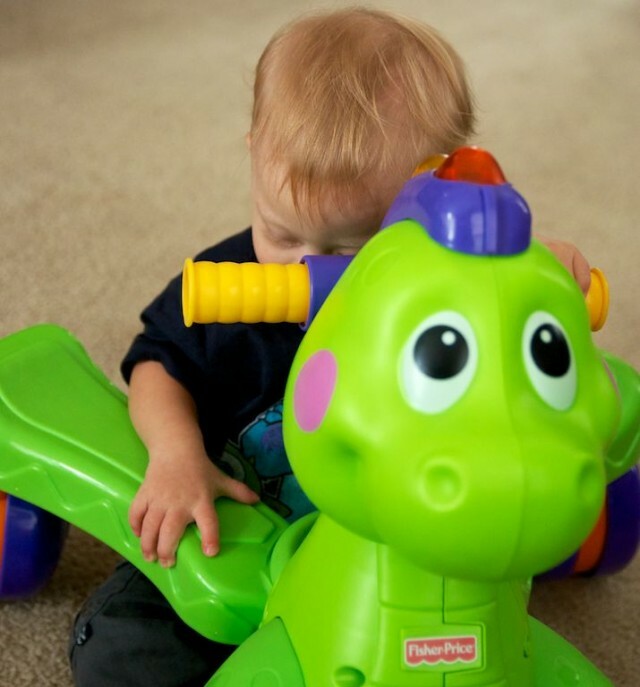 Have you tried out the Stride-to-Ride Dino Push toy? Leave a comment below and tell us about it. 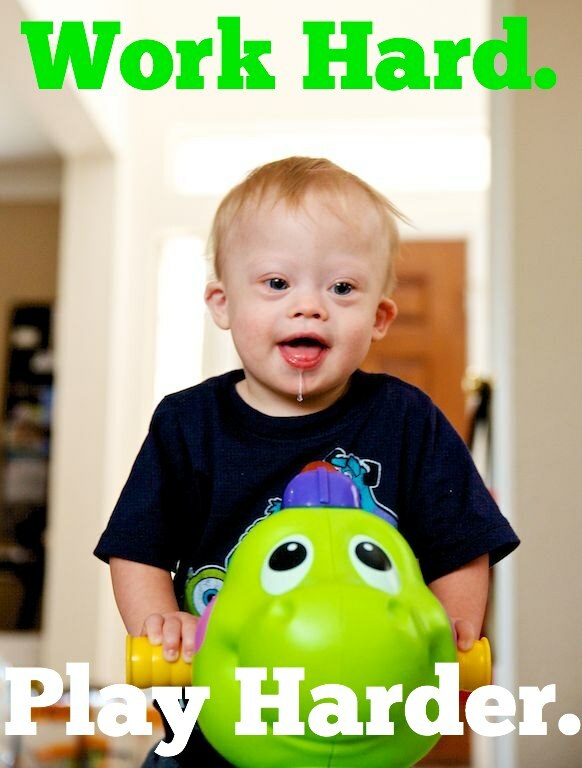 I also have a 3 year old son with Down Syndrome. His walking skills are really behind at this point. Do you think it would be sturdy enough for a 3 yeard old? Do you have any other recommendations as far as toys go that might help him with walking? By they way, Noah is so adorable! Your son is adorable. And I would just like to say you thank you aobut sharing this toy, couple weeks ago I saw this and purchased one for my 21 months old girl. Guess what? Now she is already walking with this. Thank again for sharing this. Give my love to Noah…. a sweet little man. I’m currently looking for a walker for my 12 month old son. He suffered a stroke and does not have the strength to balance himself. This one looks perfect! I’m going to look for one today! Your story is wonderful & amazing…..thank you and god bless. Off topic comment——I LOVE his wind blown tie t-shirt! I was looking for a walker for my grandson, so this was very helpful. Noah is so precious. My 23 year old daughter has Down Syndrome. You have many wonderful years to come. What a blessing you have been given! Great looking young man, my son has one also he would have worn it out if it wasn’t so sturdy made…..